2018 marks the 25th anniversary of the Royal Oak Offshore by Audemars Piguet. Although the Offshore began its life an a commemorate model to celebrate an anniversary of the Royal Oak, it eventually spun off to become its own successful watch collection. Essentially, the Offshore is the younger yet larger brother to the Royal Oak, even picking up the nickname “The Beast” when it was first introduced in the early 1990s. Since its inception, Audemars Piguet has released a dizzying amount of different versions of the Royal Oak Offshore available in a range of materials, dial colors, and complications. 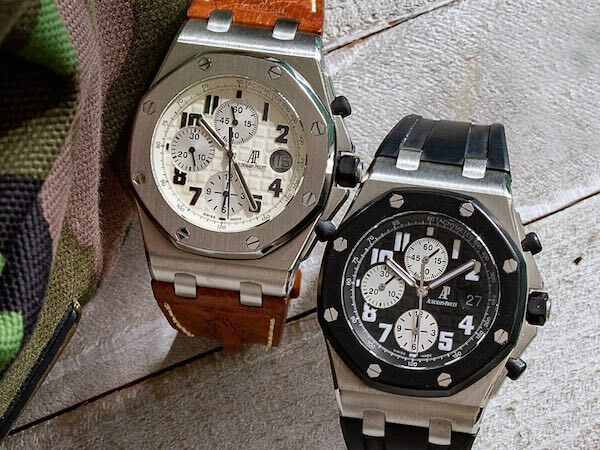 Today we shine the spotlight on two popular Audemars Piguet Royal Oak Offshore watches, which have been discontinued, but lucky for you, are still available in the secondary market. Making its debut in the mid-2000s, the Royal Oak Offshore Chronograph “Safari” is an example of a thematic ROO, similar to the Bumblebee, the Navy, and others. 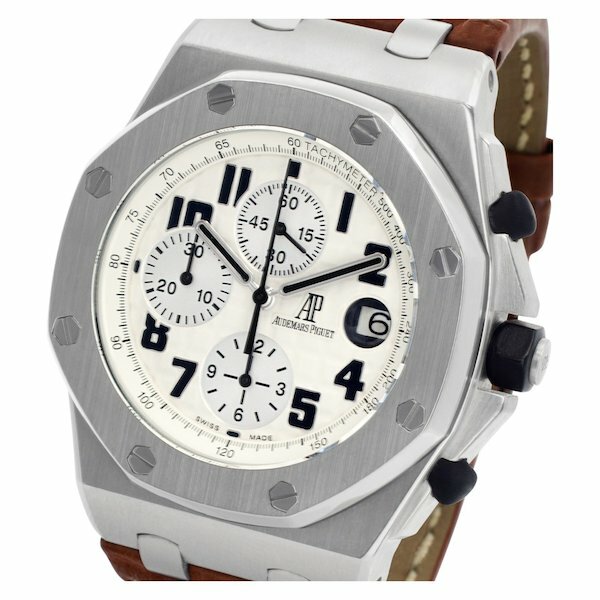 Like most other ROO watches, the Audemars Piguet Royal Oak Safari Chronograph 26170ST.OO.D091CR.01 sports a 42 mm case topped with the signature octogonal bezel with exposed screws. There are also the familiar rubber clad chronograph pushers and winding crown. The stainless steel case houses a white dial with the famed “Méga Tapisserie” pattern, complete with white gold applied Arabic numerals and white gold center hands, all coated with black luminescence. Also on the dial are the three chronograph subdials at 6, 9, and 12 o’clock, leaving room at 3 o’clock for the date window. Aside from the captivating dial, one of the recognizable traits of the Offshore Safari is the hand-stitched “Hornback” brown alligator strap, fitted with a stainless steel AP folding clasp. This leather adds a dressy touch to the otherwise sporty Royal Oak Offshore watch. Beneath the solid caseback of the Royal Oak Offshore Chronograph “Safari” is the Caliber 3126 / 3840–based on Caliber 3120 but fitted with Dubois-Depraz chronograph module. The automatic movement operates at 21,600 beats per hour and includes 50 hours of power reserve. 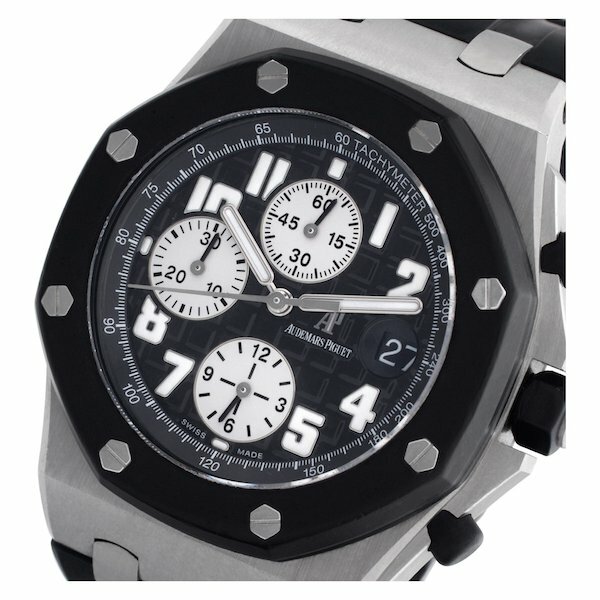 If there’s one non-metal material most associated with the Royal Oak Offshore, it is without a doubt rubber. In fact, one of the most striking design features of the inaugural Offshore from 1993 were the rubber-clad winding crown and chronograph pushers along with the visible rubber gasket under the bezel. 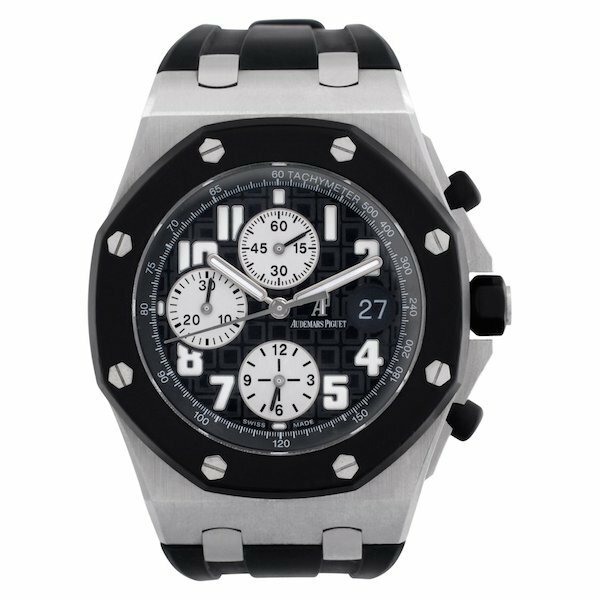 Since then, Audemars Piguet has made numerous Royal Oak Offshore models with plenty of rubber details. 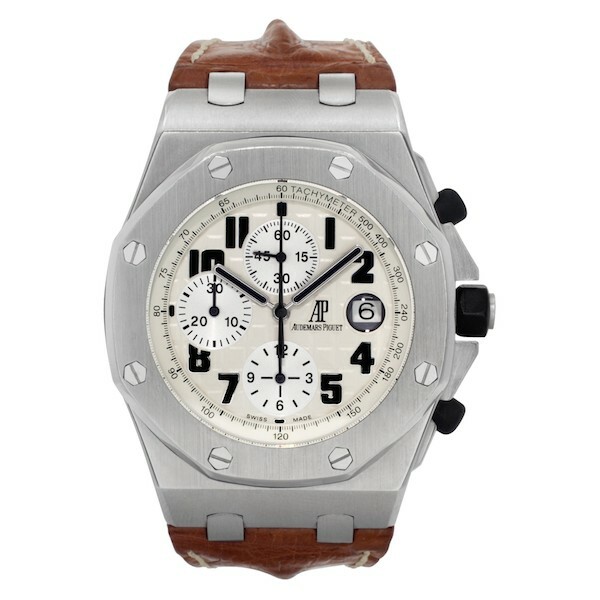 Take for example the Audemars Piguet Royal Oak Offshore ref. 25940SK.OO.D002CA.03. Along with the quintessential rubber-clad pushers and winding crown, the 42 mm case also boasts a black rubber-clad bezel. What’s more, there’s also the black rubber strap equipped with a stainless steel deployant AP clasp, tying the sporty look of this Offshore together. Matching the black rubber details is the black “Méga Tapisserie” dial with luminescent Arabic numerals, white gold center hands coated with lume, white gold subsidiary dials, and a tachymeter scale. Powering the time, date, and chronograph functions of the Royal Oak Offshore “Rubber Clad” is the automatic Caliber 2326 / 2840, beating at 28,800 bph and offering a 50-hour power reserve. Both excellent examples of Audemars Piguet Royal Oak Offshore watches, both the ROO Safari and the ROO Rubber Clad would make great additions to any watch collection. If you’re looking for a large, bold, and ultra-luxurious sports watch that flaunts iconic status in the luxury watch landscape, then the Royal Oak Offshore may be just what you need.